Cerebral palsy (CP) is the leading cause of childhood disability affecting function and development. CP is defined as a nonprogressive neuromotor disorder of cerebral origin. It cannot be correlated with any single disease or condition in Ayurveda, as it is a multi-factorial disease with clinical features of a wide variation. According to Vāgbhaṭa, it is classified in the disease categories of sahaja (hereditary) and garbhaja (congenital) and jātaja (psychosomatic) type of diseases. Of the many types and subtypes of CP, none has any known "cure." Here, an effort was made to treat a 3-year-old male child with spastic type of CP using multiple Ayurveda treatment modalities. At the end of 94 days of treatment, Pañcakarma procedures along with internal medication resulted in 10-15% improvement in the overall effect of therapy. The global prevalence of CP is 2:1000. Of the many types and subtypes of CP, none has any known "cure." Autologous stem cell activation treatment to expand the blood vessels and nourish the neurons, strengthening of body's immune system, stem cell transplantation procedure, Botulinum toxin type A injection,  baclofen intrathecal injection,  selective dorsal rhizotomy,  orthotic devices such as ankle-foot orthoses, hyperbaric oxygen therapy,  neuroplasticity  are the newer advancements being tried out in the management of CP. Ayurveda has a separate branch of clinical specialization concerning child healthcare known as Kaumārabhṛtya. There is no one to one correlation available in Ayurvedic classics with CP, but there are many conditions and some causative factors linked to etiopathology for such type of disease condition described in many chapters in different texts. Some conditions which find an overlap of symptoms of CP include phakka (a kind of nutritional disorder), pāṅgulya (locomotor disorders), mūkatva (dumbness), jaḍatva (mental disorders), ekāṅgaroga (monoplegia), sarvāṅgaroga (quadriplegia), pakṣaghāta (hemiparesis), pakṣavadha (hemiplegia) etc., under the group of vātavyādhi (neurological disorders). Contributory factors like inappropriate ṛtu (ovulation cycle), kṣetra (uterus), ambu (amniotic fluid and foetal nutrition) and bīja (sperm and ovum),  dauhṛdāvamanana (neglect of urges during dauhṛda stage of pregnant women), presence of garbhopaghātakarabhāva (substances which can cause defects or death of fetus),  incompatible garbhavṛddhikarabhāva (normal requisites for growth and development of fetus)  and improper Garbhiṇīparicaryā (antenatal regimen) may have undesirable effects on the fetus hampering its normal growth and development consequently leading to many diseases, deformities, and even death. Considering all the above, we have formulated an Ayurvedic therapy protocol to improve the condition of CP patients. Father has studied 8 th standard and currently working as a salesman, mother has studied 10 th standard, and she is house wife. Global delayed milestones and mental retardation (both since birth). Patient was delivered by lower segment cesarean section (LSCS) prematurely and did not cry soon after birth and also suffered from septicemia, convulsions, and jaundice. Due to all these clinical complications, the child could not achieve normal growth and development. Spasticity and involuntary movement became apparent after the age of 5 months and since then the parents started treating the child going to many doctors without any significant benefit. They approached us for further management. The child was being given tablet baclofen (as a muscle relaxant). He was undergoing physiotherapy and also had undergone treatment by botox injection (to reduce contractures). No family history and consanguinity found. Antenatal: Mother (25 years) was suffering from hyperthyroidism and mental stress during pregnancy and taking tablet thyroxin regularly. Natal: Preterm (32 weeks) LSCS (due to oligohydramnios and primiparity of mother) was done. Baby did not cry soon after birth. Birth weight was 1.6 kg (very low birth weight). Birth asphyxia, neonatal sepsis, pathological jaundice. Patient was totally dependent for food intake, and ̐̐was eating only semi solid food due to lack of coordination in deglutition. Appetite was poor. Diet was dominant in madhura rasa (sweet diet). Nature of activity was always assisted (due to severe spastic quadriplegia). Sleep was disturbed (2-3 h/day, 6-7 h/night). Bed wetting (had not achieved bladder control) and drooling from the mouth was there since birth. Vitals were normal. Cardiovascular system, respiratory system and per abdomen examinations had shown no deformity. Prakṛti (constitution) was Vātādhikakapha. Nāḍi (pulse) was vātādhikatridoṣaja. There was no complaint with regard to Mūtra (urine). Frequency and color were normal. Mala (stool) was constipated and passes with a foul smell and dark color, once in 2-3 dayṣ Bowel control was not yet achieved (which should have been achieved by 1.5 years of age). Jihvā (Tongue) was sāma (coated suggestive of improper digestion). Śabda (speech) was not learnt (monosyllables should have been learnt by 9 months of age). Sparśa (touch) was hard and dry (due to hypertonia and spasticity). Dṛk (eyes) showed squint in right eye (divergent and the concomitant type of squint). Akṛti (appearance) was lean (due to malnourishment). Patient was diagnosed to have the hypertonia (spasticity) and contractures at ankle and knee joint. Muscle power could not be elicited because patient was unable to follow the command. Sensory system was intact, and no abnormality found. Cranial nerve examination could not be done because of severely handicapped physical and mental state of the patient. Hyperreflexia was present, suggestive of upper motor neuron disease (which is the hallmark of CP). Babinski sign was up going (positive). Meningeal signs were not present. Spastic CP, demyelinating (degenerative) disease of central nervous system (CNS), sequel of postnatal hypoxia. "Severe quadriplegic spastic CP" as a sequel of postnatal hypoxia [Table 1]. Ninety four days as given below: Five days Udvartana followed by 5 days massage with sudation followed by 12 days Caturbhadra Kalpa Basti. Three such courses were done with the interval of 14 days. With barley powder and horse gram powder for 20 min (5 days). With Balataila for 20 min followed by sudation  for 20 min (5 days). Caturbhadra Kalpa Basti has been clearly indicated as free from complications. This protocol of Basti administration includes, four Sneha Bastis to start with, followed by four āsthāpana Basti and four Anuvāsana Bastis. Aṣṭāṅgaghṛta , throughout treatment schedule, except the days on which Basti was given. 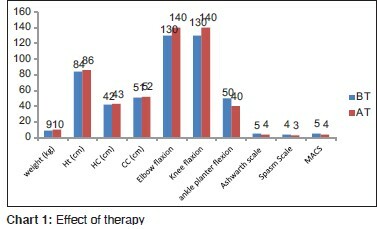 Parameters of growth, goniometric evolution to assess the range of motion (ROM), ashwarth scale to assess spasticity, spasm scale to assess intensity of spasm and manual ability classification system to assess the function of upper limb were taken as assessment criteria to observe the effect of therapy. Refer Chart 1: Here, improvement in growth might has been achieved by nourishment of Rasādi dhātus. Aṣṭāṅgaghṛta causes bṛmhaṇa (nourishing action) due to its snigdha (unctuous) and guru (heavy) qualities, udvartana helps opening up the minute channels and hence may have improved blood and lymphatic circulation. Massage provides nourishment due to its snigdha, mṛdu (soft), picchila (sticky) qualities. Sudation causes excretion of waste metabolites through diaphoresis. Snigdha Basti (anuvāsana with balataila) is said to have bṛmhaṇa effect. Height might have increased due to decrease in joint contractures. Elbow and knee flexion improved by 10° and ankle plantar flexion decreased by 10°. This effect might have been achieved due to localized vātaśamana by sudation and systemic vātaśamana by Basti. Tightness of Achilles tendon was reduced and due to that only the ankle joint shows improvement in goniometric evaluation. Spasticity is characterized by increased resistance by passive stretch, velocity dependent and asymmetric about joints (i.e., greater in flexor muscle at the elbow and the extensor muscle at the knee). This may happen due to āvaraṇa of vāta, wherein, due to āvaraṇa, vāyu cannot perform its normal function, that is, normal movement of joints (pravartakaceṣṭanam). Ashwarth scale shows 20% improvement in spasticity because initially udvartana would have helped in a reduction of vitiated kapha by its dryness-inducing and blockage-removing properties. Once āvaraṇa is removed, vitiated vāta can be pacified by further treatment. Vāyu resides in sparśanendriya which is located in the skin. Massage is said to be as tvachya (good for the skin). Hence, massage might have directly worked on vāta to bring it back to normalcy. Basti acts on CNS by stimulating enteric nervous system (ENS), there are many evidences linking CNS and ENS. Spasm scale shows 25% improvement, due to śamana of vātaguṇas which are cala and śīta due to the action of aṣṭāṅgaghṛta, massage with balataila, sudation, and mṛduśodhana Āsthāpana Basti. Manual ability classification system shows 20% improvement due to a reduction in spasticity and improvement in ROM. In this patient, the overall effect was found near 10-15%. As this disorder is incurable, this percentage of improvement also helps the patient to improve the quality-of-life (QOL). Treatment of this kind of condition is important and in that, if we are able to make small improvements in an earlier age, then it will reflect as a major benefit in later age in the form of developing skills. Previously, it was believed that neurons do not repair or rejuvenate after any injury, but the new concept of neuroplasticity says that CNS have the ability to repair their neurons by axonal sprouting to take over the function of damaged neurons. This improvement in patients also supports the concept of Neuroplasticity. Going by the results of this case study, we can conclude that Ayurvedic Pañcakarma therapy along with appropriate internal medication can do a lot for the improvement in QOL. Gupta KA. Vrudha Vagbhata, Ashtanga Samgraha, Sutra Sthana 22/3. Varanasi: Chaukambha Krishnadas Academy; 2005. p. 172. Available from: http://www.en.wikipedia.org/wiki/cerebral_palsy#cite. [Last accessed on 2010 Jan 14]. Polak F, Morton R, Ward C, Wallace WA, Doderlein L, Siebel A. Double-blind comparison study of two doses of botulinum toxin A injected into calf muscles in children with hemiplegic cerebral palsy. Dev Med Child Neurol 2002;44:551-5. Butler C, Campbell S. Evidence of the effects of intrathecal baclofen for spastic and dystonic cerebral palsy. AACPDM Treatment Outcomes Committee Review Panel. Dev Med Child Neurol 2000;42:634-45. Farmer JP, Sabbagh AJ. Selective dorsal rhizotomies in the treatment of spasticity related to cerebral palsy. Childs Nerv Syst 2007;23:991-1002. HBO Treatment.com. Available from: www.hbotreatment.com [Last retrieved on 2010 Mar 09]. Available from: http://www.en.wikipedia.org/wiki/Neuroplasticity. [Last accessed on 2012 Jan 25]. Trikamji Y. Acharya Sushruta, Sushruta Samhita, Sharira Sthana 2/33. Varanasi: Chaukhamba Sanskrit Sansthana; 2009. p. 348. Trikamji Y. Agnivesha, Charaka, Dridhabala, Chakrapani, CharakaSamhita, ShariraSthana 4/16. Varanasi: Ayurveda Dipika, Chaukhamba Prakashana; 2009. p. 320. Agnivesha, Charaka, Dridhabala, Chakrapani, Charaka Samhita, Sharira Sthana, Mahati Garbhava Kranti Adhyaya 4/18;320. Varanasi: Chaukhamba Prakashana; 2007. Agnivesha, Charaka, Dridhabala, Chakrapani, Charaka Samhita, Sharira Sthana, Mahati Garbhava Kranti Adhyaya 4/27;321. Varanasi, Chaukhambha Prakashan; 2007. Vyas A, V K Kori, Rajagopala S, K S Patel. Thesis Entitled ′A Clinical Study on Samvardhanaghrita and Shashtikashalipindasweda in the Management of Cerebral Palsy′; Drug Review; 2011. p. 9. Agnivesha, Charaka, Dridhabala, Chakrapani, CharakaSamhita, Sutra Sthana, Swedadhyaya, 14/39. Varanasi, Chaukhambha Prakashan; 2007. Sharma NP. Aacharya Vruddha Jivaka, Kashyapa Samhita, Khil Sthana 8/23. Varanasi: Chokhambha Snskrita Sansthana; 2009. p. 279. Trikamji Y. Acharya Sushruta, Sushruta Samhita, Chikitsa Sthana, 38/100-101. Varanasi: Chaukhamba Sanskrit Sansthana; 2009. p. 547. Sharangdhara, Sharangdhara Samhita, Purva Khanda 6/14-17. Smt Shailaja Shrivastava, Chauhhambaorientalia. Varanasi; 2009. p. 53. Available from: http://www.dictionary.webmd.com/terms/spasticity. [Last accessed on 2012 Mar 15, at 3 pm]. Pascual-Leone A, Amedi A, Fregni F, Merabet LB. The plastic human brain cortex. Annu Rev Neurosci 2005;28:377-401.